The ALFA Tube 2H is a handy, weatherproof 802.11 b/g/n Router. Thanks to Power over Ethernet, only one cable for power supply and network connection is required. There is an Atheros AR9331 chipset installed and a maximum output rate of 500mW/23dBm is supported. 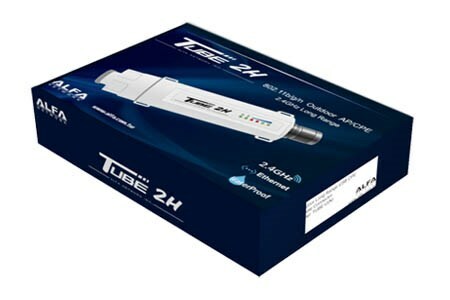 The Tube 2H from ALFA Network is a weather-protected WiFi Access POiunt with Client and Power over Ethernet function. This device provides an Ethernet connection and con be connected to wireless networks, PC's or wireless routers (e.g. ALFA AIP W525HU) via Ethernet cable or patch cable. The ALFA Tube 2H supports Power over Ethernet, which gives you svereal advantages. First, you only need one cable (ethernet cable) for the power supply and the network connection for the ALFA Tube 2H. Furthermore, there is no restriction on the data rate with a connection via an ethernet cable. Another advantage is that you can use a cable with a length of up to 60 metres. A PoE adapter is included in the delivery, an ethernet cable must be ordered in the required length. The control of the ALFA Tube 2H is independent of the operating system and the driver, since it runs through a web interface, which can be operated with diferent browsers. The ALFA Tube 2H is particularly suitable for the use on yachts, boats or campers, as the weather-resistant, splash-proof housing is able to withstand some environmental influences. Due to its weather resistance, you can easily place the device on a raised position in the open, thus establishing a good connection with remote WiFi hotspots. At the N-Male antennaport of the Tube 2H you can operate any outdoor WiFi antenna with a N-Female Connector. The antenna is typically screwed directly onto the N-Type Connector. 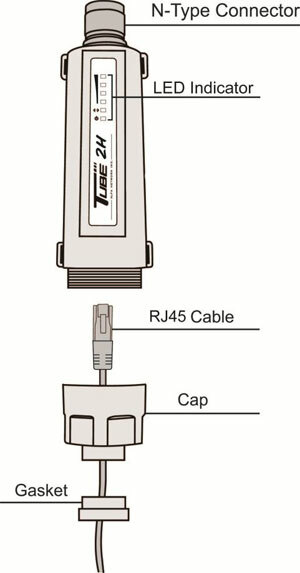 At the lower end of the tube is the PoE-compatible connector, which is terminated by a water-protected cable entry. At the edge of the housing are tabs for attaching the ALFA Tube 2H to masts using the included cable ties or pipe clamps (not included). It is also possible to use suction and magnetic mountings of Action Cams for the attachment of the Tube 2H, since this has a 1/4 female thread. If no mast is available, the Tube 2H can be made compatible with standard marine mounts using the ALFA TSM1 Adapter. 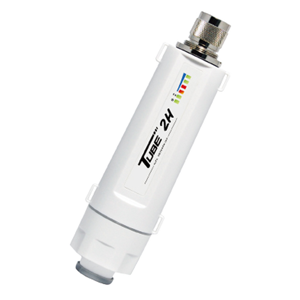 The ALFA Tube 2H supports the 802.11b/g/n standard with a maximum output rate of 500mW/23dBm and with a transmission rate of up to 150Mbps in the 2.4GHz frequency band. The Atheros AR9331 chipset can be used to cover enormous distances depending on the performance of the antenna used.